1st night of Hillside Inside 2019 kicks off with this fabulous show at the gorgeous and intimate Royal City Church in the heart of Guelph. Ethereal folk. Space Cowboy twang. Psychedelic spaghetti western. Intergalactic blues grooves. Pop noir. Since their debut in 2011, Whitehorse has evolved from magnetic folk duo to full-blown rock band. In truth, Whitehorse is never fully either one or the other, but an ever-evolving creative partnership that challenges both artists to explore new instrumental and lyrical terrain with each project. Together, Luke Doucet and Melissa McClelland’s searing Americana noir sensibility is distinguished by guitar wizardry (and instantly recognizable tone) and magnetic harmonies. 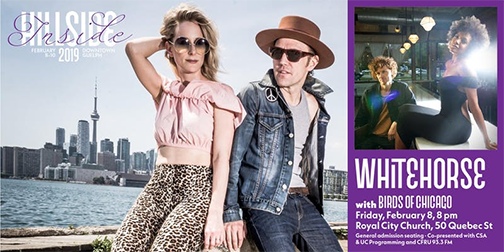 Now, the JUNO Award winning duo Whitehorse return to the early days of electric blues with The Northern South Vol. 2, the second instalment of a project that melds the grooves and melodies of the original selections with the band’s steamy, swampy, squalling approach. The Northern South Vol. 2, coming January 2019 on Six Shooter Records, deals 1950s blues bops, hellfire gospels and sexed-up cuts from Howlin’ Wolf, Willie Dixon, Jimmy Reed and more. The first single, “Who’s Been Talkin’” channels the cross-continent blues super sessions with spiny Wurlitzer, serpentine White Falcon, and, above all, a deep reverence for Howlin’ Wolf and his longtime guitar player Hubert Sumlin. Birds of Chicago, is a collective based around JT Nero and Allison Russell. Whether touring as a duo or with the full family band, Nero and Russell have emerged as two of the most compelling new voices in North American Roots music.For several years Russell and Nero’s respective bands, Po' Girl (Vancouver, BC) and JT and the Clouds (Chicago, IL), have collaborated extensively, but on 2011’sMountains/Forests, released under the JT Nero banner, they tapped into the true, bewitching power of their voices together on an entire record. It also featured the full cast of characters that would round out the Birds of Chicago ensemble -- the Clouds and Michelle McGrath, the luminous singer and picker from the hidden hills of Southeast Ohio. Saturday night is going to be more than alright with another Hillside Inside 2019 show at the cosy Royal City Church in downtown Guelph. 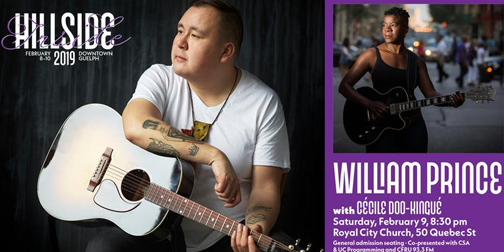 William Prince is a JUNO Award-winning singer-songwriter whose music is full of emotionally charged experiences that linger in memories. Raised on the Peguis First Nation of Manitoba. William has been honing his craft since the age of nine when he first picked up the guitar and piano. His biggest inspirations include Johnny Cash, Kris Kristofferson, Charley Pride, Merle Haggard, Willie Nelson and most significantly, his preacher and musician father. Recorded in just ten days throughout 2015, William alongside producer/collaborator Scott Nolan, created his full-length debut album, Earthly Days. He garnered honours such as “Aboriginal Artist of the Year” at the 2016 Western Canadian Music Awards and “Contemporary Roots Album of the Year” at the 2017 JUNO Awards. In a full circle moment, he inducted Bruce Cockburn into the Canadian Songwriters Hall of Fame and earned praise from not just Cockburn, but fellow inductee Neil Young. Lead by debut single “Breathless,” 2018 will see William boldly take the next step of his journey with Earthly Days being released worldwide by Glassnote Records. An exceptional stage presence, guitarist / singer-songwriter Cécile Doo-Kingué blends blues, afro-roots and soul to create a unique sound. Born and raised in New York City, first generation from Cameroon, she has lived in the USA, France, and is now an adopted Montrealer. June 2010, Cecile released her debut solo album Freedom Calling to critical acclaim. In 2011, CBC commissions Doo-Kingué to write Home, a song on immigration. Gris, released in 2012, also praised by press and music lovers alike, earned Cécile the 2013 Fondation SPACQ Edith Butler Award for Excellence in Francophone Songwriting. Doo-Kingué toured both albums extensively across Canada and Europe, firing up clubs, listening rooms and festivals alike with her face-melting playing, rich vocals, and sharp and genuine banter with her audience. February 2015, Doo-Kingué releases her third solo album Anybody Listening Pt. 1: Monologues, the first chapter of a trilogy exploring blues, roots and life in their myriad of aspects (Monologues solo acoustic, Dialogues full band, Communion live), showcasing Doo-Kingué’s songwriting in its rawest form. The album earned her accolades for her exceptional guitar playing, soulful vocals, and powerful songwriting. Blues Matters magazines, earned Cécile 5 Maple Blues Awards nominations, as well as several engagements in international roots festivals, and over 200 tour dates across Canada.